A few years ago in academic circles, a movement began called “Popular History.” Literally, this is the history of the people, not kings, queens or generals. The people…the 99 percent who never became famous, who lived their daily lives, sometimes in fear, sometimes in peace. As I research my family tree and discover each life, often only marked by birth/baptism, marriage, and death records, I wonder. These thousands of souls, here for such a brief while, then gone almost without a trace. Lately, I have uncovered Anabaptist ancestors from Friesland and Groningen in the Netherlands. People who were persecuted because they did not believe in infant baptism. I knew I had Mennonite ancestors in Groningen and Friesland (provinces in the Netherlands) because my mom’s cousin Elaine, a genealogist/historian, found them years ago. Many of these Anabaptists, followers of Menno and other religious dissidents, hived off the Netherlands population and migrated first to Germany then to Pennsylvania in the eighteenth century. Their descendants are known as the Pennsylvania Dutch, Amish, Dankers, Hutterites, and other names today. Many other Anabaptists stayed in Friesland and Groningen, and eventually, surviving the religious wars, conformed to the Dutch Reformed Church. Centuries later, their descendants, my mom’s ancestors migrated from the Netherlands to Holland Michigan. The Fryslanders were the tall blonde Indo-European the Romans encountered centuries before the Common Era began, which is how we know anything about them (Romans left records). Apparently, the tribe was a tough lot living on the coast of the North Sea. The Romans never conquered them, but Caesar worked out an agreement, because later some of the Frisians as well as other Anglo-Saxons became Roman soldiers. During Hadrian’s reign they were posted along the marches in the north and west of England. One of the old Roman sites archeologists in England have excavated along Hadrian’s wall in northern England is named “Dumfries” which means “the Frisian camp” in Latin. My DNA suggests I am 5% Irish.. a genetic maker found people in the northern and western areas of the UK as well as Ireland and Iceland. On Dad’s side, I have found records for paternal ancestors, religious dissidents who migrated from Wales, Cumberland and Northumbria, in northern and western UK in the seventeenth century. Given some of my dad’s ancestors came from this part of England…I have to wonder if my parents ancestors were related in the distant past? Well perhaps. This entry was posted in Ancestry, Demography, Elder Blogger, Ethnicity and Race, Family History, History/Art History, Hobbies, Memories, Religion, Retirement Living, Travel by SchmidleysScribblins. Bookmark the permalink. Did you do a DNA test to find out about your DNA? I know very little about my family tree especially because my ‘biological’ father wasn’t actually my biological father as he couldn’t have children. Mostly I don’t think about it, but every once in a while I get curious. Yes, I had a DNA test. Great fun. Found a couple of cousins who had done it too, including one who was adopted. Cousins that you didn’t know before? I knew they existed. Found it amazing that Ancestry linked us using DNA. My grandfather, father’s father, did a very thorough and documented genealogy of the Gunthorpes. I have focused on recording folks from 1900 onward. There’s one site with my mother’s father’s name…Thomas Barnum, and I have added to that site. They won’t take my children tho. Most of my work is focused on nineteenth and twentieth centuries. I only listed my daughter because she is linked to my tree and working on her dad’s tree. Like your new page and header photo — most unusual and attractive bloom to me, but I recall you shared earlier. Interesting ancestor history. Haven’t studied mine enough in genealogy book to discuss in such depth as you have here, but basically, between both parents ancestors — going back to 1300s — they were from England, Scotland and Germany; religious involvement for some, but recall reading one came to establish business, another part of establishing prominent east coast city. Yes, I shared the header photo earlier. 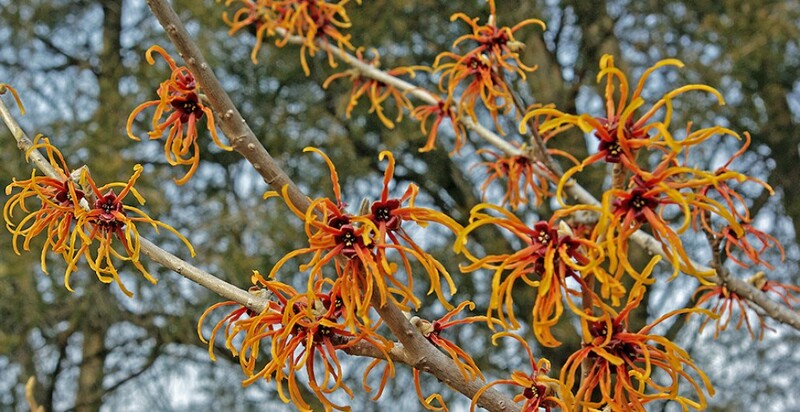 This shrub (witchhazel) blooms in spring at our local botannic garden. I’d like one in my yard but have run out of space for new shrubs. Well almost. I’ve spent years studying European history, particularly, the history of the Netherlands. My family has been “into” our family history since I was a kid. Dad was what we once called an antiquarian, and he was descended from Mayflower, Revolutionary patriots, Civil War vets, etc. while Mom was the child of comparatively recent immigrants. They wrote many things in my baby book that I have tried to confirm. I’m fortunate because the Dutch kept good records, church records, a population register (the Nazis used to find Jews) and records from the Dutch East India company among others. Also have aunts, cousins (one in the Netherlands) with a keen interest in our history. And now a daughter and granddaughters showing interest in keeping the story alive. These days we pray that the idiot in the White House doen’t end the story. Know some European country areas and cities with info so could probably construct more of a family picture of those early centuries. Know I have ancestors who fought in Revolutionary and Civil wars, prominent also in establishing another eastern state judicial government, but a Penn. ancestor who had at least one slave. Also, a variety of stories as early settlers went “west” – northern Ohio, Presby. church minister and more. Recent centuries my mother’s half-brother participated in Colo.’s last homesteading rush establishing a claim in early 1900s when they were young adults — he later sold land. Also have info on my husband’s ancestors which included primarily France, Germany, England, other, and more interesting stories for our children. Will explore more of all this in time — though there is a question of time in these later years, I guess. Time is of the essence. Build your story like a ‘case’ and write it in bits. Insights will follow. Fascinating history! It is amazing to me how knowing an area where ancestors lived can tell so much about them. All I know about one great grandfather is he was born in Ireland. Wish I knew the region but it is lost in a time without records. You have wonderful information! Knowing the history of regions, areas, etc. helps us piece the story together. My late husband’s mother came over from Ireland on a Potato Boat and worked as a maid in a fancy home in New York. She and the youngest son fell in love and eloped. He was the father of two boys (the youngest my husband) and died of a cerebral hemorrhage at the young age of 31. When that happened the family kicked her and the two boys out but a very wealthy woman in Nyack sent the boys to a private school and got work for her. A pretty wild background and she never got over it. It just shows how different our lives can be ! In the nineteenth and twentieth centuries, and even today many young women from different ethnic origins here and elsewhere have worked as maids and servants to gain a foothold in life. We have a few in our family also. Your husband seems to have have a life full of both bad and good luck. Sad that the husband/father died so young. I hope this story is recorded somewhere for his progeny. Fascinating Dianne. Very interesting read. We pass by the exit for Dumfries (Virginia) on our trips down south, and now I know its Latin meaning, thanks to you. Good old Dumfries. We were stationed at Quantico for three years and I never knew about the family connection to the settlement (Dumfries) just off base, which was probably named for the old site in England. We have a large Mennonite population here in the San Joaquin Valley. Also a college and seminary run by the Mennonites. Did you know that today, the average Mennonite worldwide lives in Africa and is Black? A college and seminary? I didn’t know they were so established. Wow. I’d be surprised if my parents weren’t distant cousins. We are heavily north England, Scotland & Ireland on both sides with a little extra here and there. Under the skin we are all cousins.